So it’s been a while. 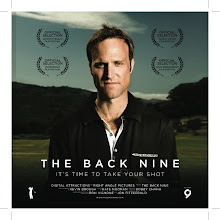 After working hard to finish the first movie in the The Back Nine series, I had managed to accumulate enough points to qualify for the Golf Channel Amateur Tour’s National Championships. That was the good news. The bad news is that my game had deteriorated. Ironic that I would make a movie about seeing how far I could take my game, yet my game actually suffered in the process. All it takes is a tournament at PGA West to make this crystal clear. As I limped my way into PGA West for the big tourney, I was faced with this harsh reality. Finishing middle of the pack in my flight, it was obvious that I needed a new approach. I was fortunate that one of the audience members for our theatrical screening in Santa Monica was generous enough to offer his support. Art Maffai was inspired by the movie, had been working on some new concepts and was kind enough to introduce me to Bob Grissett, the Director of Instruction at The Golf Academy. I learned a great deal from Tim Suzor at Kinetic Golf, and without him, I would not have been able to go from a 15 handicap to a 4. He is, however, in Arizona and it’s too difficult for me with my family based in Los Angeles, and other work commitments to make enough consistent visits to move my game forward. I will continue to work with Tim when the opportunity presents itself. After a couple of meetings and some strong words of wisdom, Bob agreed to take me on as a student. Not only is this the best facility in Los Angeles, with the latest in state-of-the-art equipment, but Bob has trained with the best, including David Leadbetter, Bob Toski and Byron Nelson, just to name a few. With his experience and encyclopedic knowledge of the game, there was little doubt that I would have an opportunity to take my game to another level, with a new approach. My first lesson after the Nationals, Bob gave me a few great drills, and we were both pleased with my next visit. The swing has to start with a good foundation. 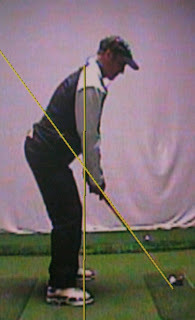 You can see from the picture below, my posture has improved dramatically, and my swing now starts back on plane. I will continue with the drills until my swing has been fully revamped and am ready to take it to the course. With this new approach, we believe it's important to work on the different elements that make up a golf swing, and really focus on drills, before spending too much time playing rounds. I remain committed to the quest, will do the necessary work, and film along the way. The clock is really ticking now. Two weeks until our World Premiere at the Newport Beach Film Festival at the Lido April 25th at 3:45. Following the screening, the Rainey Fine Art Gallery will host an Art Exhibition to showcase the art and photography done over the course of the journey. It had been a couple weeks since the last tourney and I thought I was ready for Sunday. Truth is, I was ready to get out and play, ready for an escape, ready for a walk on the short grass. But I was not prepared for competition. That's what happens when you don't practice. Ben Hogan once said, "For every day you miss practice, it will take you one more day to get better." With too much going on in my other life, and a new puppy, there was no time for sleep, much less practice. I was excited to play, having just come off my first session with my new mental coach, Dr Joe Parent (Zen Golf; Zen Putting). When he asked me about my current game, I said I had issues with alignment. Everything was going to the right. In a heartbeat, we were up out of our chairs and I was given some great tips. For this Sunday's tourney, I would put them in play. And these visualization techniques make up the sum total of the silver lining that day. My ball went towards the target more than ever before. But that doesn't help if you chunk it. I didn't hit many greens, and the beautiful surroundings at Tijeras Creek took on a darker tone as the day wore on. I struggled off the tee. Irons came up short. Even missed a two foot putt - usually the strongest part of my game. Can a single digit handicapper duff one off the tee? You bet. I spent most of the front nine scrambling. I was fortunate to pull off a sandie the first time I found a bunker. Second time, I was digging a hole to China. Took me 3 to get out! With a downhill lie in a footprint, my task was to get up over 6 foot lip. No fun. When I finally got the ball out, I was ready to keep digging and just bury myself in the deepest, darkest sand, whatever was left of it. "The Horror, the horror." Okay, so I'm no Marlon Brando, but I was living the Apocalypse Now. I limped my way around the course, as night closed in around us. Daylight savings had begun, but it felt dark to me. Okay, it wasn't THAT bad. I still enjoyed the challenge, and bounced back with some good shots on the back nine, and was able to laugh my way through the walk of shame to the scorers table. But all I could think about on my drive back home was doing a painting to capture the essence of this mostly dark day on the links. Title was easy - Black Sunday. Now it's back to the practice tee. Need to put in the work so I'm ready for the next tourney, hopefully, the Western Masters in the desert. I like it there in Palm Springs, my home away from home. Never mind the sand. My worlds collide. Golf Tourney. Oscar Night. Second tourney of the year for The Golf Channel. The Babe course at Industry Hills. Didn't do so hot in the first. Tied for 4th Place and played poorly. Wanted to play better. Big day in the Film business, my day job. Oscar Night. Good day for the rags to riches Slumdog Millionaire. And beating the odds. Other than the filmmakers, nobody believed in this movie, when the script made the rounds. In my quest to eventually play professional golf, I can sympathize with the underdog. Is there a category beneath underdog, I wonder? Started off fine, tee shot down the middle. Then proceeded to skull my pitching wedge into the back bunker. Did sink 5 footer to get up and down. Same drill on next hole. Hit fairway. Miss green. Chip up and sink the putt. Starting to feel good about having green in my backyard. Short game is better. Feeling like this is going to be a day to remember. Then tension mounts, on the unfair 3rd hole. Nice drive of 220 leaves you 150 navigating through and/or over family of palm trees - to back pin 10 paces from a lake! Couldn't go left and play safe. No room. Palm trees there too. Smooth 8 but not good enough. Wet. Gotta then carry water on 4th shot so I go uphill past pin. Three more strokes before I'm in. 7! Triple! But Slumdog didn't pack it in when nobody wanted their little movie. They believed and pushed forward. I had to find some inspiration, right? Took a bogie on the next, but then regrouped with a few pars. In a fun twist of fate, I found myself staring down that same lake, only now it's guarding right side of green. I had pulled a drive and had to chip out to 50 yards. Played safe into green, left of pin and water, but had a chance for par...And with the lake in the background, I drained the 12 footer for par! Felt like payback. Had a few more misses coming down the homestretch, but was overall pleased with the way I played. I hung in there, proved I can get up and down and finally hit some good irons. I didn't win but had a great time and took managed to eek out 3rd Place with an 85. Played better than score says. Three bad holes, but I had 8 one putts! There be the silver lining. And Slumdog Millionaire wins 8 Oscars. Chalk one up for the Underdog. After turning 40, I decided to chase a dream, to begin a quest to play professional golf, as I enter THE BACK NINE of my life. To many, this seems like an impossible goal. To others, anything is possible. What will it take? How long will it take? Is it even possible? In hopes that there are other dreamers, who can identify with the pursuit of a great challenge, I have been filming the journey. Surrounding myself with the right team of golf and fitness instructors, doing the research and committing the time, the experience will be documented and can be found at THEBACKNINE.com. From instructional tools to equipment changes, the progress and the obstacles, this site and blogs will track the project. I just turned 42 - or 21 again as my wife likes to say - and part one of the movie series is nearly complete. I've joined The Golf Channel's Amateur Tour for the second time and will track the adventures here. I hope you will join me on what is sure to be the journey of a lifetime.